I have heard that reply many times. In fact,I said the same thing until I realized the connections cheese and dairy have on the animal cruelty angle as well as what you’re actually eating. Even vegans like something melted on their sandwich. I know where you’re coming from. Nothing worse than expecting cheesy goo and getting mealy gunk. So, finding some truly dairy-free cheese singles the image of gooey sandwiches fill my head, but the thought of a mealy texture overshadows it. I tried Galaxy Nutritional Foods Rice Vegan as opposed to the typical soy cheeses that are available. 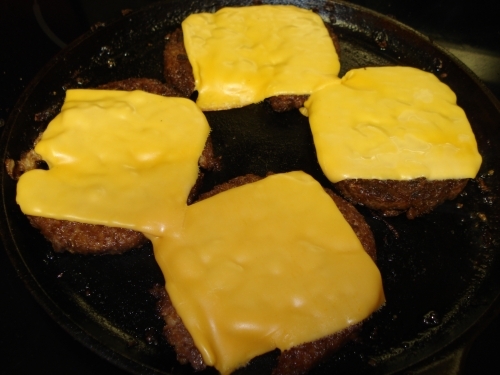 It is available in both block-style and singles, I have a few packs of the latter, Pepper Jack, Cheddar and American flavors, to give a try. 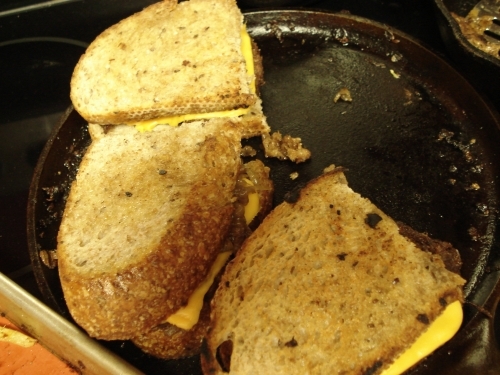 Of course the test that first comes to mind, where the cheese should run and hold firm two slices of bread would be the perfect grilled cheese, and it works great for that. Even adding a few slices of fresh out of the garden tomato and gluing it all together, it makes one of my favorite sandwiches. But a grilled cheese? That’s too easy. We need more layers to meld, more flavors to lend it’s own taste to. Patty melt, that’s should do the trick. 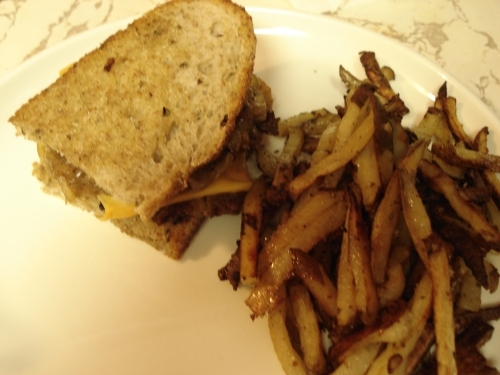 And besides, I love patty melts and it has been a long time since I indulged in greasy goodness. So, let’s see, we have some tasty grilled onions a few pieces of fresh rye and some veggie burger patties mashed as flat as possible, it works great, trust me. But, what is a patty melt without the melt? Two slices of Rice Vegan American should work (Sorry, no Swiss available). Rice Vegan seems to do the trick, it does need a bit longer to melt as traditional cheese but the melty goodness can be attained and the flavor is good, no mealiness. The only thing you don’t have with Rice Vegan is that stringiness when you pull two pieces apart, but the flavor is there and the ability to hold all of those layers together is there. Also, I have found many non-dairy cheeses contain casein to lend the ability to melt. I don’t understand the point of making a soy or almond cheese and then adding a dairy ingredient to it. If you can’t make it truly dairy-free then why bother? Rice Vegan is dairy free and contains no casein, yet still has the ability to melt. 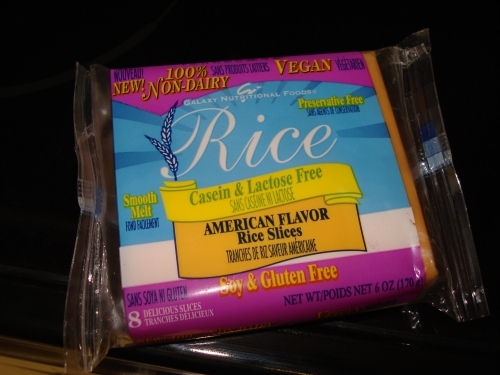 Of all of the single serving cheese substitutes I have tried, Rice Vegan comes out on top. It melts well and tastes excellent. Compared to traditional cheese it has half a gram of saturated fat as compared to Kraft Singles, which contains 2.5 grams per slice! If you still have a cheese craving Rice Vegan can fill the void.